This month on the Gender-Nutrition Idea Exchange, we asked Sara Stevano, Postdoctoral Fellow in the Department of Economics in SOAS, University of London and the Leverhulme Centre for Integrative Research on Agriculture and Health (LCIRAH), to share findings from a recent systematic review on agriculture, time use, and nutrition. Assessing the available evidence, Sara identifies ways in which gender influences time use in agriculture and the coping strategies chosen to manage workload burden. She points out policy considerations related to time use necessary to effectively leverage agriculture for nutrition. The findings from this systematic review will also be presented at an IFPRI policy seminar on May 7, 2015. Agricultural development plays a role in improving nutrition. However, agricultural practices and interventions determine the amount of time dedicated to agricultural and domestic work. Time spent in agriculture – especially by women – competes with time needed for resting, childcare and food preparation, and can have unintended negative consequences for nutrition. 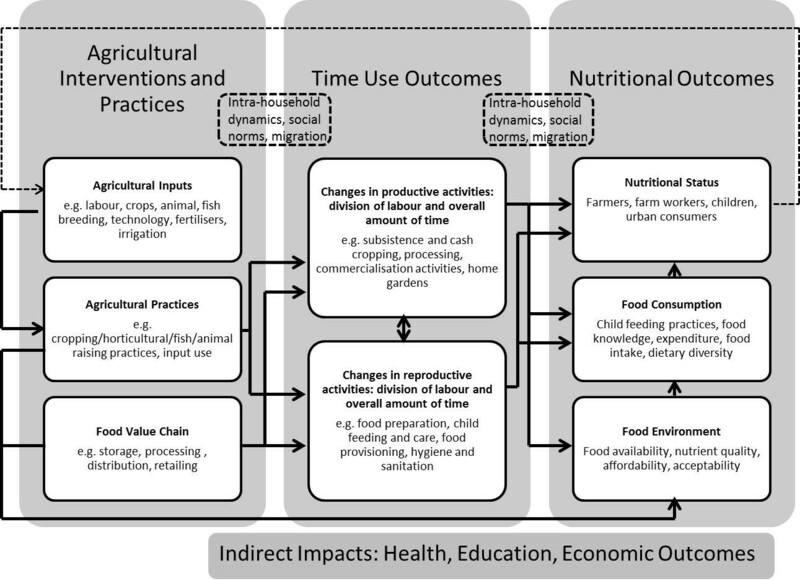 The diagram below represents that theory of change that links agriculture and nutrition via time use. Does the evidence confirm this hypothesis? To find out, we conducted a systematic review on agriculture, time use and nutrition in low- and middle-income countries. We used a pair-wise search to include studies looking at the relationship between agricultural practices or interventions and time use, on the one hand, and studies on the relationship between time use and nutrition, on the other hand. We began with 5,938 studies and, after a long process of screening and exclusion of irrelevant studies, we ended up with a group of 89 studies. Of the included studies, many look at agricultural practices and time use, with some extending to nutrition as well. Fewer studies are on agricultural interventions. Another group instead looks at time use, especially mothers’ time allocation, and child nutrition. Thanks to the inclusion of qualitative and mixed methods studies, in addition to quantitative ones, as is most typically done in systematic reviews, this review has a larger evidence base and explores the impact pathway, rather than impact size. However, the majority of the studies in the review are quantitative. Most studies are on Asian and sub-Saharan African countries, with India standing out as the country with the highest concentration of evidence. 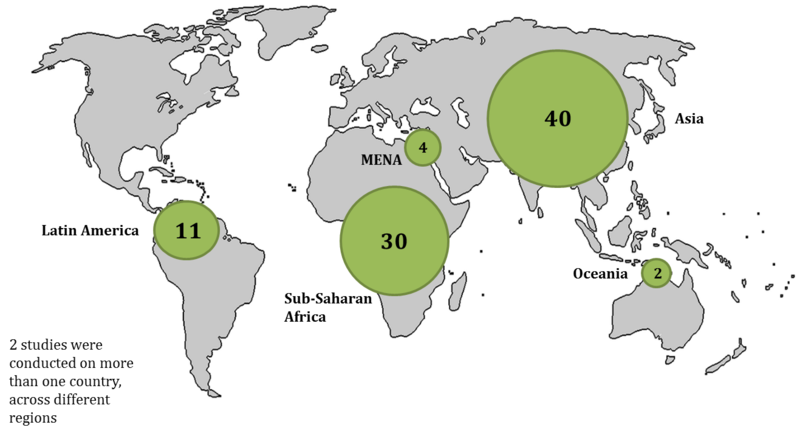 However, geographic coverage extends to Latin America, Oceania and the Middle East/North Africa region (Figure 2). Although we did not restrict the scope to studies on women’s or mothers’ time, the vast majority of the studies reviewed have a specific focus on women or mothers. A few studies look at children’s participation in agricultural work but, interestingly, not a single study has an exclusive focus on men. 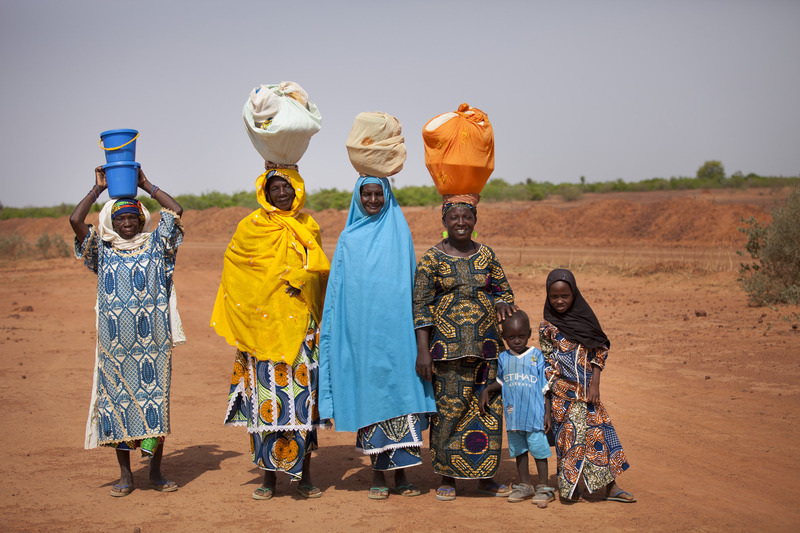 Agricultural interventions tend to increase women’s, men’s and children’s time burdens. However, the studies included in this review do not provide clear-cut evidence on the nutritional implications of agricultural practices and interventions, even when these result in increased time spent on agricultural activities. Nutritional impacts are varied because households and household members respond to increased time burden and workload in different ways. Why are responses different? It depends on a number of important differentiating factors that include income and the possibility to purchase food, household socio-economic status more generally, household type and composition (in particular the presence of members who can take up domestic work), and the types of indicator used to assess food consumption, security or nutrition. What interventions are needed then? There are several policy conclusions to be drawn. On the one hand, the results reaffirm the need for gender sensitive agricultural policy. On the other hand, the mixed evidence in terms of nutritional impacts highlights the importance of taking the differentiating factors into account in policy. Identifying the ways in which time burden is managed is the starting point for gender sensitive agricultural policy for improved nutrition. We argue that different sets of policies are needed to address specific forms of burden management, shouldered by households and/or individual household members. We identified four types of responses to increased workload. The first is the simple extension of the working day at the expense of leisure and sleep. Second, households may switch to purchased foods. Third, households may reduce time for feeding and preparing food. Fourth, the increased burden can be managed by devolving domestic work and child care to other household members, typically other women or children. In each of these scenarios, which are not mutually exclusive, the households and household members who are likely to be more affected may change and, consequently, the interventions needed to alleviate extra burden for improved nutrition are different. For example, in the case where individuals respond by working more and sleeping less, the most vulnerable are the workers themselves, rather than their children. Therefore technologies and provision of services that alleviate reproductive burden would be needed. In contexts where an increase in purchased foods is observed, it would be useful to use regulation and incentives to increase the availability and affordability of healthy and nutritious food in the appropriate outlets. Time matters; especially that of women and of the poorest. However, an increase in time commitments has a complex impact on nutritional outcomes, and outcomes depend on how it is managed. The varied responses offer innovative approaches for policy makers who want to leverage agriculture for nutrition. The review was funded by A4NH and the Leverhulme Centre for Integrative Research on Agriculture and Health (LCIRAH), and was conducted by a Main Team composed by Deborah Johnston (SOAS/LCIRAH), Elizabeth Hull (SOAS/LCIRAH), Hazel Malapit (IFPRI), Sara Stevano (SOAS/LCIRAH) and Suneetha Kadiyala (LSHTM/LCIRAH). The project also received advice from experts on time use, gender and systematic reviews, including Agnes Quisumbing (IFPRI), Birte Snilstveit (3ie), Imraan Valodia (Wits), Indira Hirway (CFDA), Naila Kabeer (LSE) and Valeria Esquivel (UNRISD). Johnston, D, Stevano, S, Malapit, H, Hull, E, and Kadiyala, S. 2015. Agriculture, Gendered Time Use, and Nutritional Outcomes: A Systematic Review. IFPRI Discussion Paper 01456, Washington, D.C.
Esquivel, V. et al. 2008. Explorations: time-use surveys in the South. Feminist Economics. 14(3), pp. 107-152. Hirway, I. 2010. Understanding Poverty: Insights Emerging from Time Use of the Poor. In: Antonopoulos, R. and Hirway, I. eds. Unpaid work and the economy: gender, time use and poverty in developing countries. London: Palgrave Macmillan, pp. 22-57. Hull, E. et al. 2013. Developing gender-sensitive approaches to agriculture, health and nutrition: recognising gendered time and budget constraints. LCIRAH Policy Briefing. London: Leverhulme Centre for Integrative Research on Agriculture and Health (LCIRAH). UNSD. 2005. Guide to producing statistics on time use: measuring paid and unpaid work. New York: United Nations Statistics Division (UNSD). Very useful. Is the review itself available online? Thanks for your feedback, Bill! The report is still being finalized, but we will make sure to update the blog with the link to the report when it is ready.